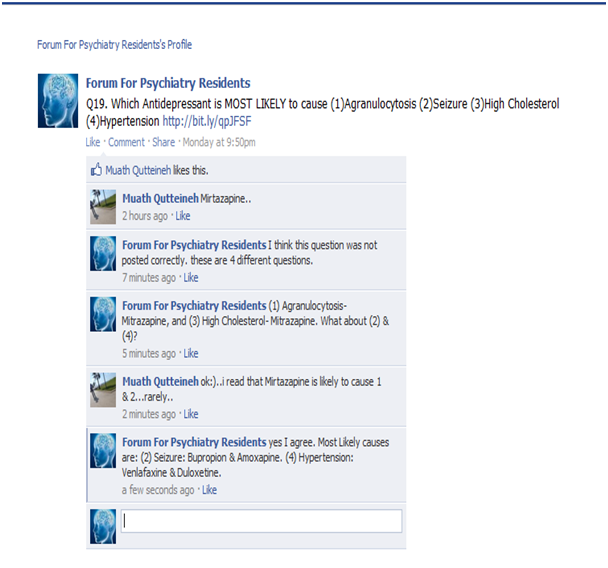 I will be posting important questions from Psychopharmacology section here . Everyone is encouraged to participate by either posting questions/answering questions/posting doubts related to Psychopharmacology. Clinical Vignettes: Drug Interactions with Antipsychotic Agents. 1. Patient on Quetiapine diagnosed with AIDS, started on Protease Inhibitor (HAART). (a) What is the consequence of this interaction? (b) What is the underlying mechanism responsible for this consequence? (c) What will you do next? 2. Patient on Clozapine, Fluvoxamine added. (b) What will you do next? (c) What is the underlying mechanism responsible for this consequence? 5. Patient on Quetiapine, Carbamazepine added. (a) Transition from Clozapine to Olanzapine is safe in terms of cholinergc rebound. (b) Transition from Olanzapine to Risperidone is safe in terms of cholinergc rebound. 11. Based on ADA/APA recommendations, which of the following parameter is MOST FREQUENTLY monitored in patients on Atypical Antipsychotics. 12. Which of the following medication is least likely to cause Tardive Dyskinesia? 13. Which of the following statement is FALSE regarding Sedative-Hypnotics? (d) Co-administration of Zolpidem and SSRIs can extend the duration of hallucinations in susceptible patients. Q16. Which of the following SSRI is least likely to complicate treatment due to drug interactions? Q18. Which of the following Statement is FALSE regarding Fluoxetine? (d) Pt on Fluoxetine gain weight initially followed by weight loss. PI's are generally potent 3A4 inhibitors. Quetiapine is a major substrate of 3A4 and would therefor have an increase in serum concentration when these two medications are combined, likely leading to increase in adverse events. I would switch quetiapine to another medication that either is not metabolized by 3A4 or has multiple metabolic pathways (metabolized by more than one cyp enzyme) given that PI's are an integral component to anti-retroviral therapy (as far as I know). Clozapine is mainly metabolized by 1A2, although minor metabolic pathways include 2D6 and 3A4. Fluvoxamine is a potent inhibitor of 1A2 and also of 3A4, leading to increase in serum clozapine concentration. The consequence of this interaction is, of course, increase in adverse reactions, although fluvoamine has been used to give lower doses of clozapine while still achieving therapeutic serum levels of clozapine. In this case, I would check the serum level of clozapine, and if within the therapeutic range, I would let it ride, unless of course I was suspecting an adverse reaction. In which case, I would still order a serum concentration and then discontinue vs decrease dose of fluvoxamine. Ziprasidone is metabolized by 3A4 and also cytosol aldehyde oxidase. Erythromycin is a potent inhibitor of 3A4 and therefor has the potential to increase serum ziprasidone's concentration. The consequence of this interaction is again an adverse reaction. I would change erythromycin to another antibiotic which does not inhibit 3A4. Of note, amongst the macrolides, clarithromycin is also a 3A4 inhibitor. This is an excellent question! Olanzapine is, like clozapine, primarily metabolized by 1A2. Smoking, or more specifically, inhalation of poly-aromatic hydrocarbons (also produced by smoking cannabis), induces 1A2. The result may be the decrease in serum concentration of olanzapine. I would probably increase the dose of olanzapine and may check the serum levels as well prior to doing that. Of course the other option is to treat the nicotine addiction. Carbamazepine is generally referred to as a 'pan-inducer' meaning it induces all cyp enzymes (with the possible exception of 2D6). It has been found to have a potent effect on 3A4 induction and would there decrease quetiapine serum concentration as this is 3A4 metabolized. The two possible options are to change to a medication which has a different metabolic pathway (preferred IMO) vs increasing dose of quetiapine. Excellent answers with accurate explanation. Q 1-5 & Q19 are answered. Do not use epinephrine. Reason: because hypotension is produced by alpha adrenergic blockage property of DRAs, & these drugs also block the alpha adrenergic stimulating property of epinephrine, leaving beta adrenergic stimulating property untouched. As a result epinephrine will cause paradoxical worsening of hypotension and hence epinephrine is contraindicated in antipsychotic induced hypotension.